As the Travel Oregon Ask Oregon expert for the Coast, one of the most frequent questions I’m asked is, “What are the things I shouldn’t miss on my trip to the Oregon Coast?” While the answer often depends on your interests, the experience that you are looking for and how long you have to explore, I’ve boiled my list down to the top 10 must-see attractions for visitors traveling the length of Oregon’s coastline. Even though I visit many of these places regularly, I am still amazed at the beauty and history these locations offer, which can be different with every season and every visit. I’m starting this virtual tour in Astoria on the North Coast and working my way southward. See the remains of the 1906 shipwreck Peter Iredale on the beach at Fort Stevens State Park in Astoria. If it’s a clear day, drive straight to the Astoria Column that crowns the town for panoramic views of the entire region. Next, a visit to the Columbia River Maritime Museum reveals the story of the Northwest’s seagoing history in an engaging way and offers a scenic viewpoint to observe the river. Just south of Astoria is Lewis and Clark’s Fort Clatsop, where it is easy to picture yourself back in time over 200 years ago when America’s most famous explorers spent the winter here. Walk through the full size re-creation of the explorer’s fort, and you’ll see their charts laid out on the candlelit desk and smell the smoke from the fires that kept the chill off during the dank, dark and wet winter of 1806. 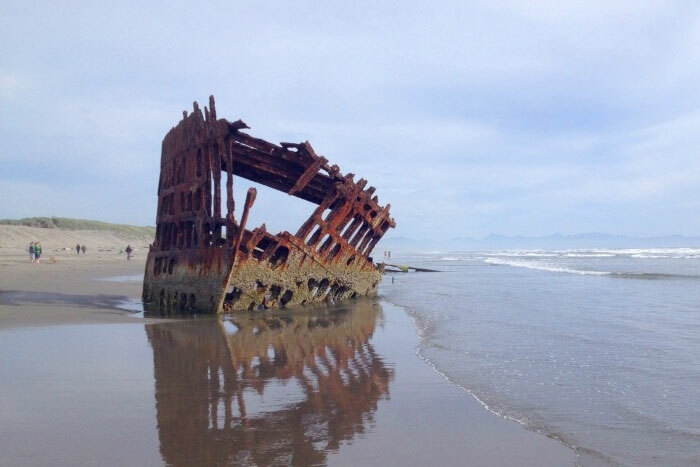 Before you continue your journey south, head due west to see the remains of the 1906 shipwreck Peter Iredale on the beach at Fort Stevens State Park. In the Oregon Coast’s first beach resort town, a walk down Seaside’s Promenade is one of the Coast’s most unique experiences. It’s the Oregon Coast’s first beach resort town, and a walk down Seaside’s Broadway is one of the Coast’s most unique experiences, passing shops, restaurants and family attractions including a large arcade, old-fashioned carousel, bumper cars and indoor miniature golf. 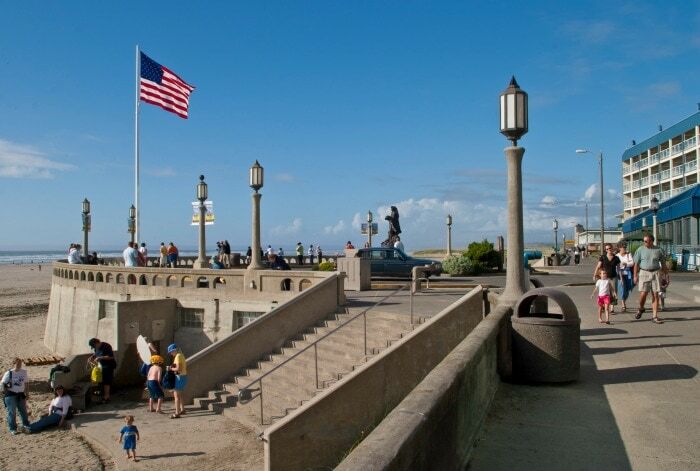 At the beach is the historic automobile turnaround and oceanfront promenade, among the Coast’s most famous landmarks dating from the 1920s. 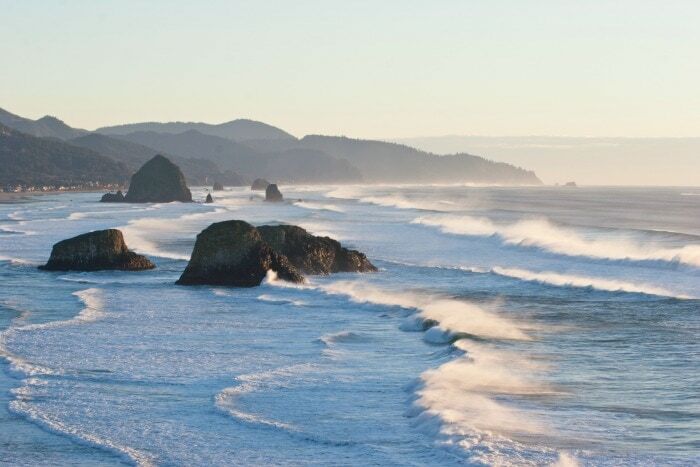 On a clear day at Ecola State Park, you’ll look out over endless ocean along with Crescent Beach, Cannon Beach, Haystack Rock and Cape Falcon. The view from Ecola State Park may be the most photographed on the Coast. 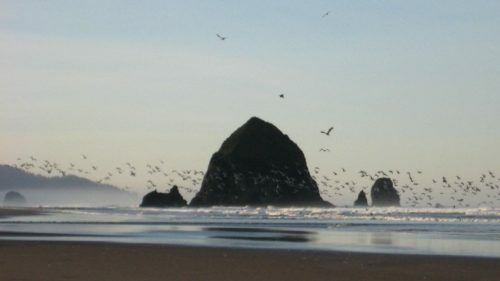 On a clear day, you can look out over endless ocean along with Crescent Beach, Cannon Beach, Haystack Rock and Cape Falcon nearly 15 miles to the south. 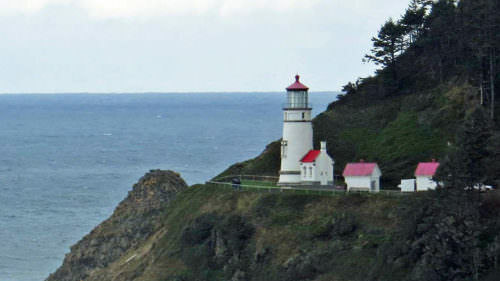 The park also offers the best viewpoint to see the Tillamook Rock Lighthouse offshore. Watch for bald eagles, Roosevelt elk and gray whales during migrations. One of the great side trips off Coast Highway US 101 between Tillamook and Pacific City leads visitors to stunning views at Cape Meares, Cape Lookout and Cape Kiwanda. One of the great side trips off Coast Highway US 101 between Tillamook and Pacific City is the Three Capes Scenic Loop, which leads visitors to stunning views at Cape Meares, Cape Lookout and Cape Kiwanda. 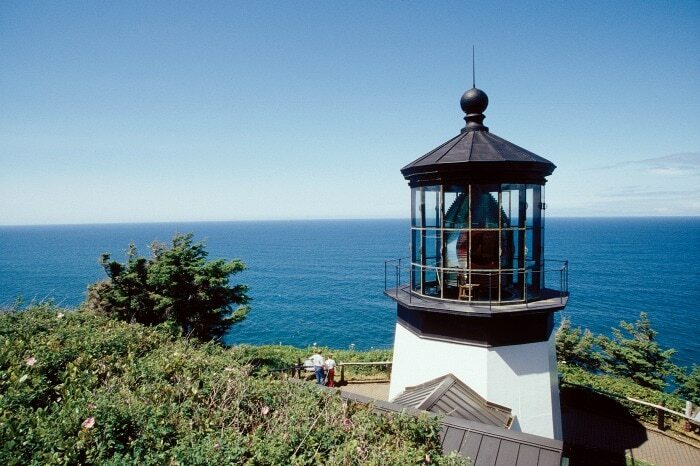 Cape Meares offers a short walk to a lighthouse with panoramic views along the way. Cape Lookout is perfect for a picnic, beach access or hike to the end of the cape. Cape Kiwanda offers tide pools at its base, but scale the giant sand dune for views of the dramatic sculpted sandstone cliff sides to the north. A pretty lighthouse, near shore rocks that offer habitat and viewing of seabirds and marine life and a spectacular tide pool area are among the attractions at Yaquina Head. A pretty lighthouse, near-shore rocks that offer habitat and viewing of seabirds and marine life, and a spectacular tide pool area are among the attractions here. You might see gray whales here even during non-migratory times. 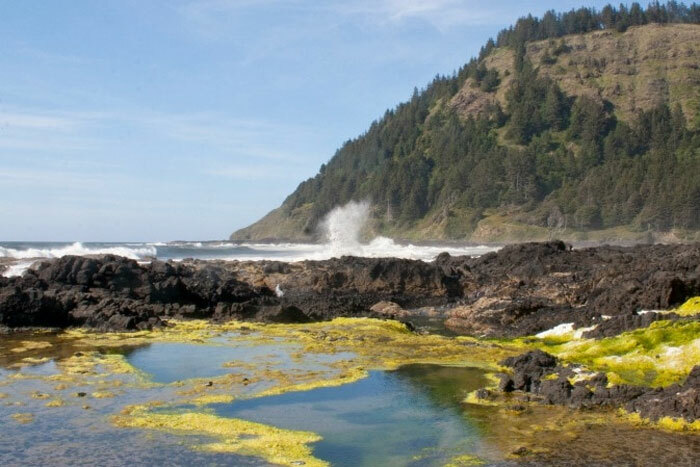 Spend a few minutes at the dramatic wayside viewpoints or spend a day or a week hiking the dramatic stretch of coast through rainforest and along rocky coastline at Cape Perpetua Scenic Area. Spend a few minutes at the dramatic wayside viewpoints, or spend a day or a week hiking this dramatic stretch of coast through rainforest and along rocky coastline. View attractions such as Spouting Horn, Devil’s Churn, Cook’s Chasm and Thor’s Well. In all, the Scenic Area encompasses 2,700 acres connected by 26 miles of hiking trails. The Interpretive Center serves as the hub and main parking area. Between Florence and North Bend, the Oregon Dunes dominate the coastal landscape for more than 40 miles. 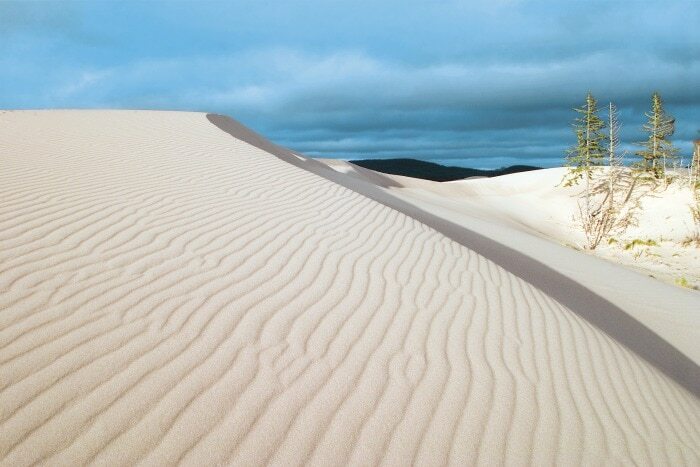 Between Florence and North Bend, the Oregon Dunes dominate the coastal landscape for over 40 miles. The easiest access for general sightseeing is through day use areas at Jessie M. Honeyman Memorial State Park and the Oregon Dunes Overlook just south of Florence. Hikers can venture into dune country away from ATV traffic at the John Dellenback Dunes Trail near Eel Lake Campground south of Reedsport. Dune buggy tours and ATV rentals are available near Florence and North Bend. A don’t-miss side trip off the Coast Highway southwest of Coos Bay leads to three spectacular State Parks on Cape Arago: Sunset Bay, Shore Acres and Cape Arago State Parks. Another don’t-miss side trip off the Coast Highway southwest of Coos Bay is the Cape Arago Beach Loop, which leads to three spectacular sites: Sunset Bay, Shore Acres and Cape Arago state parks. 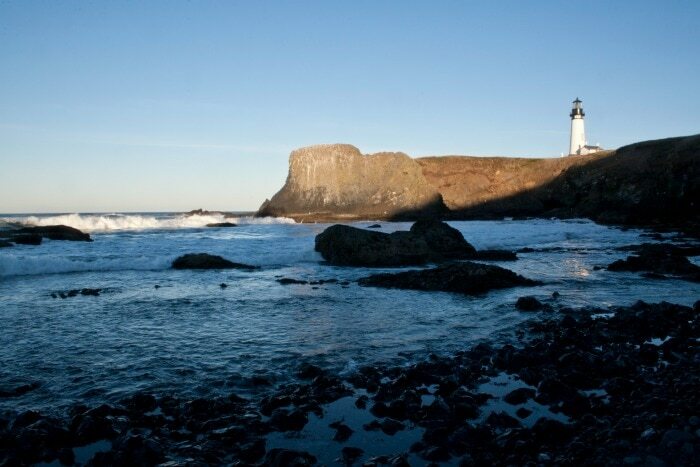 Enjoy stunning cliffside viewpoints, easy walking paths, seal and sea lion viewing at Simpson Reef and views of the Cape Arago Lighthouse. Hiking trails connect the three parks, and the end of the cape offers access to a beautiful intertidal area. 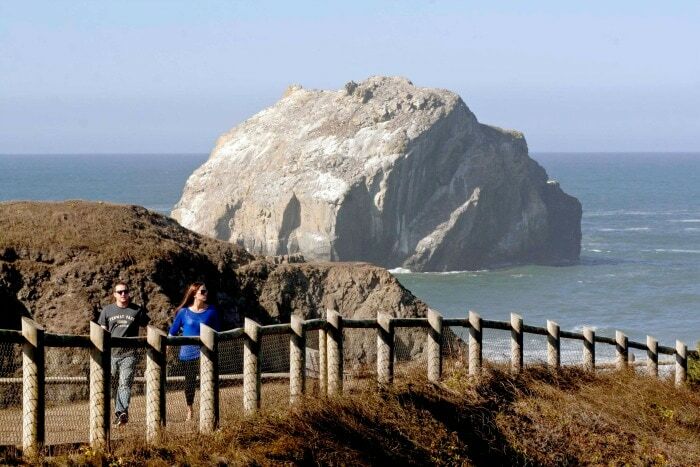 The Coquille Point and Face Rock viewpoints are not to be missed on Bandon’s Beach Loop Drive. With its numerous rocky spires and offshore rock formations, the beach at Bandon is one of the most beautiful stretches of beach adjacent to any Oregon Coast town. 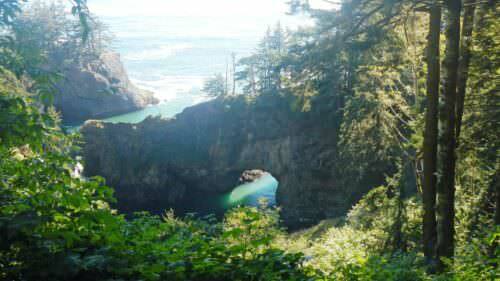 Beach Loop Drive in Bandon offers access to several astounding viewpoints and beaches. The Coquille Point and Face Rock viewpoints are not to be missed. Tide pools and abundant sea bird life on the rocks are also major attractions. You can spend a day or a lifetime enjoying the views and trails you’ll find along the Samuel H. Boardman State Scenic Corridor. 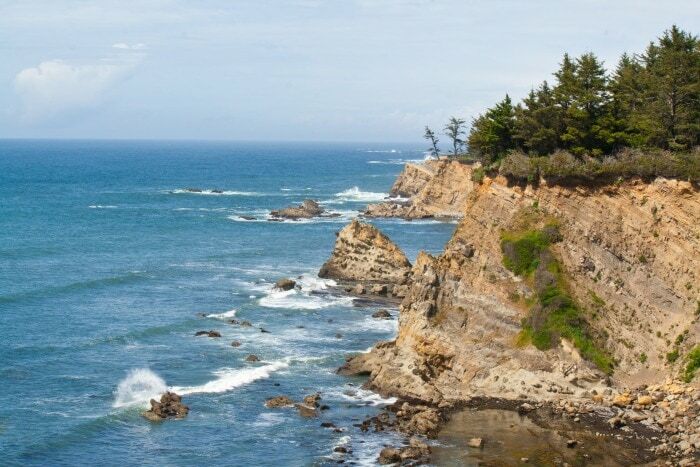 This 12-mile stretch of coast offers easy stops at stunning scenic viewpoints, access to beaches and tide pool areas, and hiking trails including one of the most beautiful stretches of the Oregon Coast Trail. You can spend a day or a lifetime enjoying the views and trails. 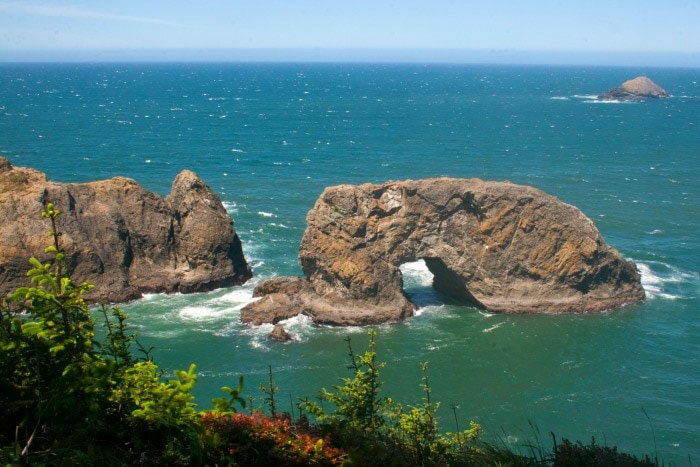 Some of the top stops along the Samuel H. Boardman State Scenic Corridor include (north to south) the Arch Rock Viewpoint, Natural Bridges Cove Viewpoint, Whaleshead Beach State Park, House Rock Viewpoint, Cape Ferrelo Viewpoint and Lone Ranch State Park. Well, that’s it. I had to pick 10. Which means I have left off amazing areas like Devil’s Punchbowl at Otter Rock, Seal Rock, the Cape Blanco Lighthouse, Humbug Mountain and Harris Beach State Park in Brookings. Maybe I should do a top 15 list… or maybe 20? 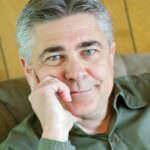 Gary Hayes is publisher of Coast Explorer Magazine and founder of Explorer Media Group, a travel media and marketing company based in Seaside. Gary is a native Oregonian whose earliest memories include working on his grandfather’s fishing boat on the Oregon Coast. Now living in Cannon Beach, Gary is an extensively published photographer and writer focusing on the Oregon Coast and the Northwest's food and wine culture. He also serves as Executive Director of the SavorNW Wine Awards.